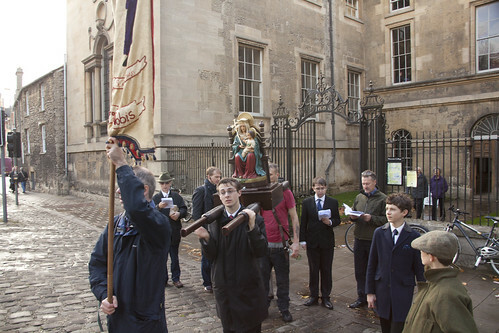 Yesterday was the annual LMS Pilgrimage to Oxford in honour of the city's Catholic martyrs. This year we visited the site of the martyrdom of Bl George Napier, the Castle Gallows, where he had his eternal nativity in 1610, after many years of ministering as a priest in his native Oxford, and the surrounding area. 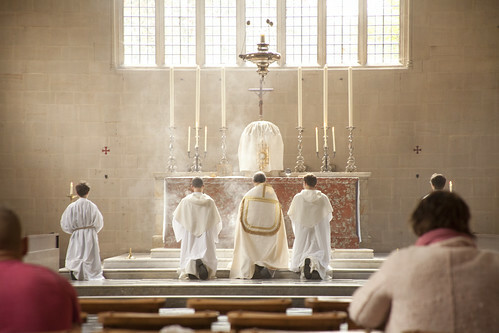 The LMS has for a number of years had this pilgrimage at the Oxford Blackfriars, celebrated by the friars in their own Rite, the ancient Dominican Rite. 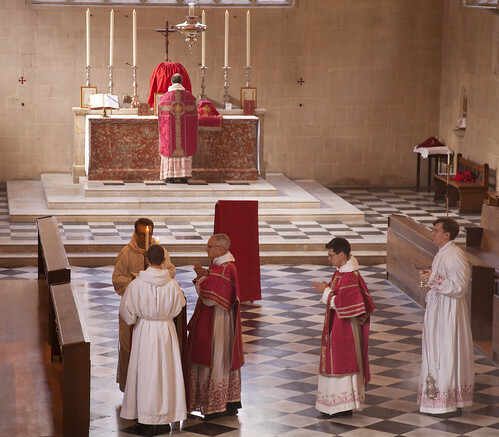 It is a lot like the ancient Roman Rite, but there are a number of differences which are interesting to see, and it has an austere elegance all of its own. 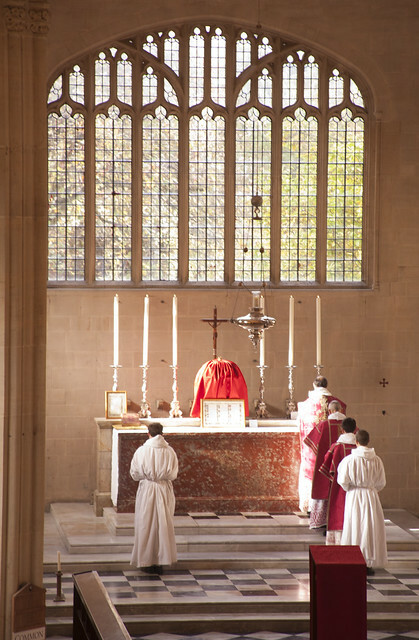 The Schola Abelis, Oxford Gregorian Chant choir which exists to support celebrations of the traditional liturgy, accompanied the Mass as usual, with Dominican Chant. Just as the rubrics of the Mass are a little (actually, quite a bit) different from the Roman ones, so the chant melodies and the whole feel of the chant is a bit different. It was an entirely chant Mass, with a Dominican Chant Mass Ordinary to go with the propers. The changable weather and 'storm Brian' may have contributed to a lower than usual turnout, but the Schola Abelis had the biggest group I think we have ever fielded at a service: fifteen. A sudden downpour during the procession added to the interest of the occasion, as did our being joined by one of Oxford's ... characters. I'd not normally encourage someone to carry a processional statue while holding in one hand a half-drunk bottle of wine, but he was very attached to the idea and it seemed a pity to discourage him. 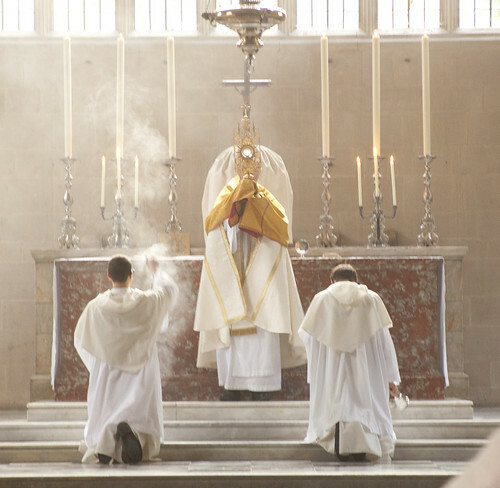 He assisted at Benediction as well. The public witness of the procession, and the liturgy, meant something to him. These things have a power which we cannot fully articulate or perceive. The saints in prison managed without the liturgy by a special grace but for the rest of us it is necessary. It is the normal and indispensible food for the soul, to sustain us and to help us grow in the faith. 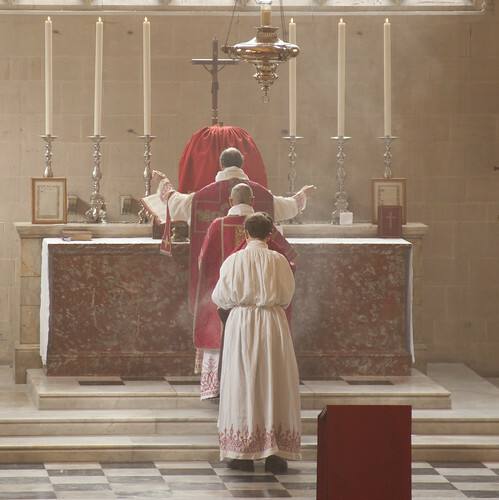 I know for many Catholics for the last half-century the liturgy has been a trial, a source of suffering. 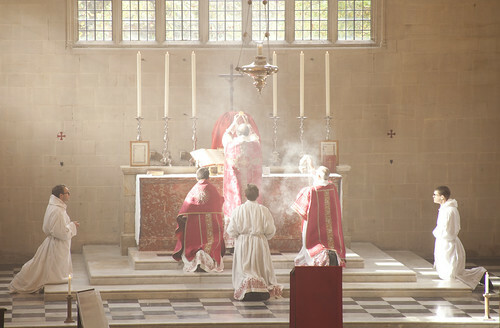 It is no small thing to contribute to a liturgy which is an occasion of light and consolation. 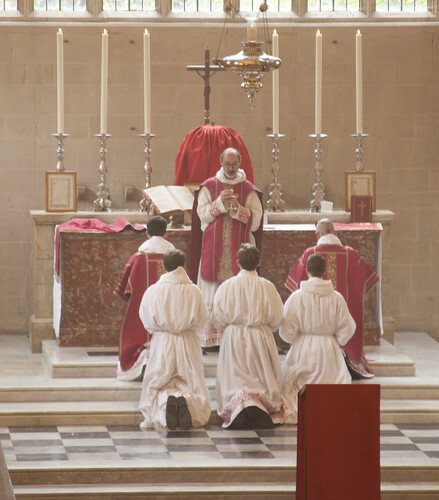 The value of the Traditional Mass, in whatever Rite it may be, and the other traditional liturgical acts and devotions, cannot be calculated. Don't allow yourself to miss out on what should be a Catholic's birthright.